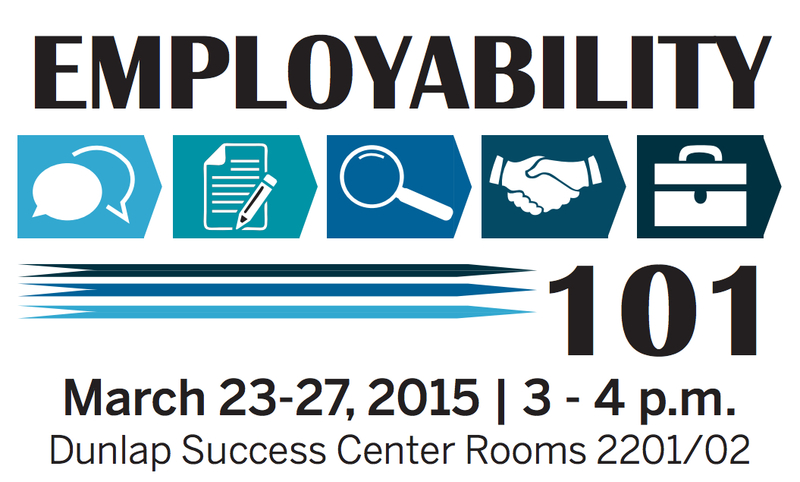 The Career Center will offer “Employability” workshops next week. Are you ready for the next step after graduation? Engage in multiple workshops that will give you the edge as you enter your career. Workshops range from Branding & Networking, Interviewing, Job Negotiation and how to approach the first 90 days on the job. Time: 3 – 4 p.m.
How are employers using social media in the hiring process? Learn how to showcase your employability through your online profile. Discuss the purpose of a resume, various sections to include, formatting option, and different resume and cover letter styles. Learn the importance of proper dress in business situations, as well as the benefits and drawbacks of using the internet to job search. Make a successful transition from the classroom to the workspace with these tools for life after graduation. 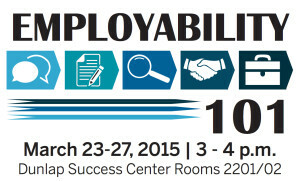 Attend the Employability 101 workshop series, and get the chance to win prizes!